In front of our flat in the 3rd floor of a house in Rome, Italy, across the street is an old villa with a typical Italian tiled roof. When we first came here some twelve years ago, there must have been a dozen or more pairs of Common Swifts (Apus apus) nesting under the tiles. 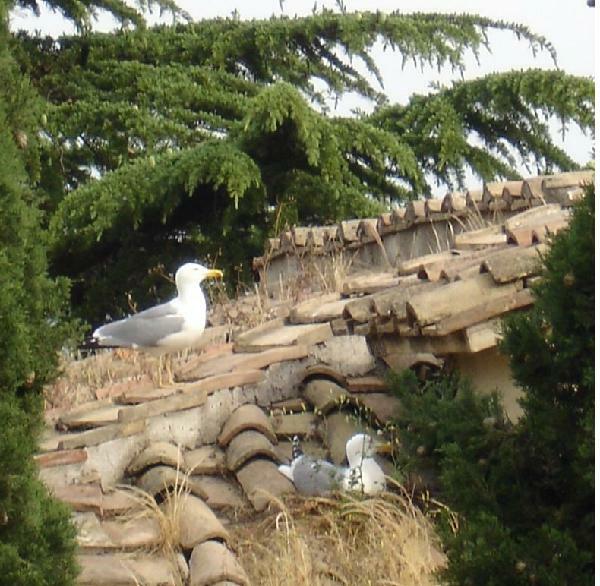 Five years ago a pair of Yellow-legged Gulls (Larus cachinnans) nested on the tiled roof . They raised three young successfully and have done so each year since. In 2005 I noticed, on at least two occasions Common Swifts coming into their nests were knocked down and swallowed whole. This behaviour can be documented by photo here for the first time. Since then this pair of Gulls obviously specialised in catching the new diet as the Swifts flew into their nest holes. Young Common Swifts were also pulled out of their nest and swallowed now and then. This has been going on until today. Last spring there were only five or six nesting Common Swift pairs left. In the season, 2008, I personally saw four Common Swifts swallowed and, since I am not always at home to watch, I imagine that others suffered the same fate. Similar circumstances at nest entrances involving Racoons (Procyon lotor) was reported by Günther and Hellmann (2002). From this it seems that the Common Swift does not react to enemies which stalk its nest entrance. This is why one has to fear that the species will not be able to adapt to this new threat. Gory & André (1997) described the explosion like dispersion of the Yellow-legged Gull in the Mediterranean area and feared a limiting factor of the Common Swift by the newly adapted behaviour also of this Gull species. 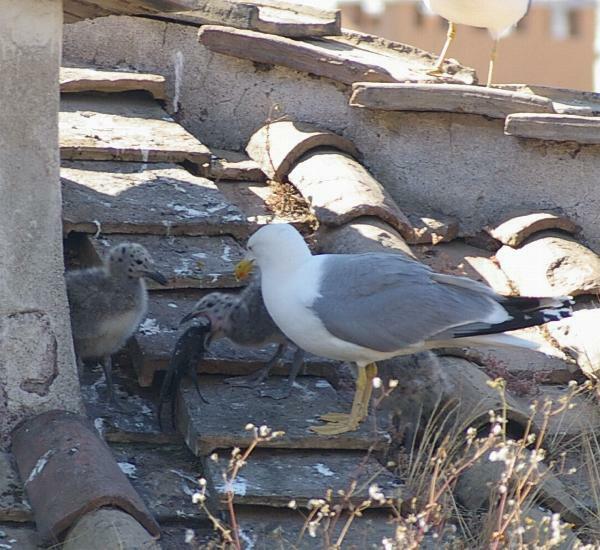 Since the Yellow-legged Gull population in Rome is steadily growing and since the Gulls here seem to prefer tiled roofs as nesting sites just as some swift species do, the outlook for Roman Common Swifts is to be considered bleak.